Subaru has revamped the 2018 Subaru Outback 2.5i petrol engined Lineartronic in time for the 182 plate change. It claims the 2018 model has a significant upgrade in technology and trim. 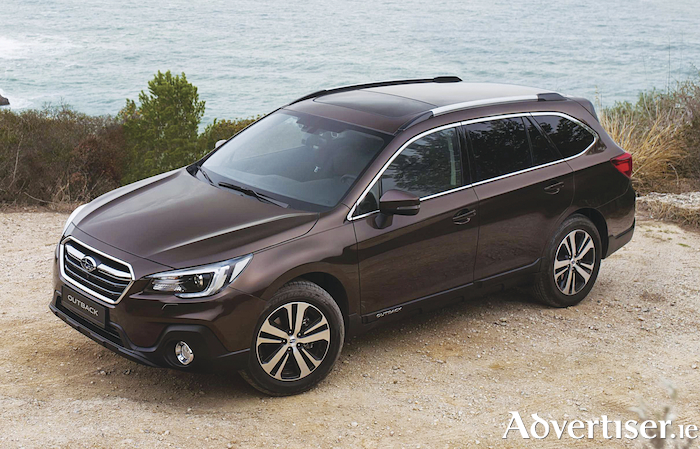 The Japanese manufacturer describes the Outback as a rugged crossover estate, redesigned to raise cabin quality and refine the model’s plethora of safety offerings. Subaru claims the Outback update showcases Subaru’s ‘Confidence in Motion’ brand ethos, offering excellent safety, capability and reliability credentials. Among the changes to the exterior is the redesigned front grille, bumper, door mirrors and headlights. The hexagonal grille redesign showcases a sharper, more defined shape. An addition to both the exterior design and the safety suite is a new front view camera, which is placed on the front grille. The camera can monitor a 180 degree area in front of the car that would normally be in the driver’s blind spot. Subaru has also added a side view camera mounted at the base of the passenger door mirror. Displaying the area diagonally in front of the passenger side of the Outback, the resulting imaging, if required, allows drivers to navigate through narrow spaces with greater ease. A welcome addition to the Outback is the inclusion of 'lane keep assist', which completes the EyeSight driver assistance safety technology suite – included as standard on all 2018 Outback models. Lane keep assist offers gentle steering control if the vehicle is about to deviate from its lane at approximately 65kph or above. Subaru’s eye sight driver assist technology suite also includes: adaptive cruise control, lead vehicle start alert, lane sway and departure warning, pre-collision braking system and pre-collision throttle management. Steering responsive headlights are also new to Outback, improving driver safety and increasing visibility at night. The headlight beams mirror the driver’s steering input to illuminate corners when turning. Inside is a subtle redesign, including new decorative gloss black panels and silver surrounds to create a consistent and sophisticated look, while the touchscreen size has been increased from seven inches to a new eight inch multifunction colour touchscreen for the SE Premium model, which is also compatible with both Apple CarPlay & Android Auto and DAB radio functionality. Outback is powered by a naturally-aspirated 2.5-litre FB25 petrol unit. Subaru reminds us that due to the size and shape of Subaru’s Boxer engine, it is installed lower down and further back than a conventional engine for a lower centre of gravity and transitions beneath the passenger compartment in the event of a collision, providing an added level of safety for occupants within the vehicle. Subaru boasts the Boxer engine – with its unique ‘punch-counterpunch’ rotational cycle – offers smoothness, low vibration and noise, plus excellent accelerator response. The 2.5L engine produces 175PS at 5,800rpm and 235Nm torque at 4,000rpm. There are two trim levels available on the 2018 Subaru Outback for Irish buyers – SE and SE Premium – both of which offer very generous levels of standard equipment. SE models are equipped as standard with eyesight, adaptive cruise control, hi-beam assist, Subaru rear vehicle rear detection, automatic LED headlamps and headlamp washers, 17-inch alloy wheels, heated front seats, keyless entry and push-button start, and privacy glass, as well as an eight-inch touchscreen infotainment system, incorporating audio, smartphone connectivity and rear, front and side view parking cameras. The system also incorporates Subaru StarLink and is Apple CarPlay and Android Auto compatible. Prices for the 2018 Subaru Outback start from €46,995 for the SE Model and €49,995 for the SE Premium. Pricing for the new model remains similar to the current diesel Outback, with updated features and redesigns added.